Wasps are a common summertime problem for homeowners throughout New England. Finding and dealing with their nests is usually best left to a professional pest control company for many reasons. Those with children or who are susceptible to allergic reactions must be especially cautious, as a wasp’s venom can cause serious, sometimes fatal, reactions. Additionally, many homeowners may be unable to effectively reach and remove the wasps themselves. 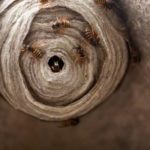 The best way to prepare yourself and understand what you are dealing with is first to determine the type of wasp you’ve encountered. Wasps are classified as either solitary or social. If you come across a wasp that’s flying solo, and it doesn’t head towards others or an evident nest, you are most likely seeing a solitary wasp. Solitary wasps generally won’t bother you or your family unless provoked; however, unlike solitary wasps, social wasps build nests and congregate in swarms. Once a nest is formed, these feisty pests will continue to return to that location and become territorial. This is when a homeowner’s problems start. Got Wasps? At Modern Pest Services, our licensed professionals understand how to get the job done right – GUARANTEED! Learn more about our HomeCare Green year-round protection program that covers 60 pests – including Wasps! 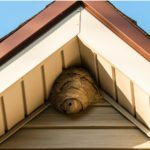 Most wasps prefer to build their bulbous nests in protected, shaded areas such as under eaves, porch roofs, decking, sheds, and steps. 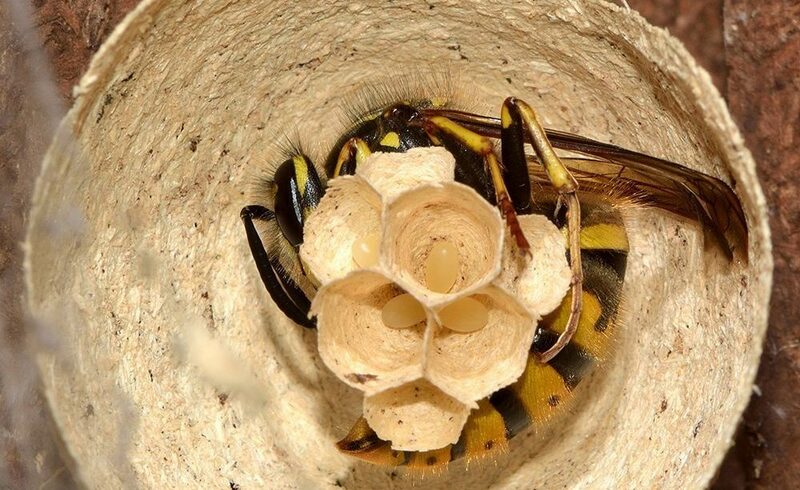 Wasp nests are often hard to locate because wasps can easily maneuver into small spaces, burrow into the ground or construct their nests high into the canopy of trees. One of the easiest ways to locate a nest is to wait until dusk and observe the wasps’ flight pattern. This will often lead you to the area of their specific dwelling. If you do come across a nest, be sure to contact a professional pest control company. Years of experience enable pest management professionals to quickly and efficiently identify and deal with any wasp nests they’ve located on your property. Most pest management professionals will offer homeowners the option of chemical-free wasp removal for foraging wasps that have become bothersome. The most common option used to naturally remove wasps is through the use of traps. Typically these contain a pesticide-free liquid that lures the wasp into the trap and are designed to make an escape improbable. Unlike homemade traps, professional traps are more successful because of their construction and placement. Made of high-quality materials with specially designed apertures, pest management professionals will strategically place these traps around your property where wasps habitually forage. These areas include outdoor bars, gardens, outside eating areas, near patios, and children’s play areas. In addition to traps, pest management professionals may offer organic sprays as an option. Much like chemical pesticides, organic sprays are applied directly to wasp nests and work quickly to kill the wasps. Unlike chemical pesticides, however, organic sprays offer homeowners peace of mind in regards to the impact on their health, the soil, and overall environment. Typically, the treated nest is left in its location after spraying. This ensures that returning wasps are also eradicated once they enter the nest. Additionally, wasps that return to find their home removed will typically build a new one. By leaving the treated wasp nests in place, the pest management professional is applying an effective control measure for the future. The hardest wasps to remove are those located within walls. If you hear concentrated and un-nerving buzzing sounds from within a wall, the best way to proceed is to immediately call a pest control company. Severe damage can be done by wasps that form nests on the inside of walls. Do not make the mistake of trying to kill any you may see outside the wall. This will only result in the remaining wasps moving farther into the wall and adjoining woodwork. Another mistake people often make is using an aerosol spray in this situation. Spraying an aerosol through a hole and into the wall will eventually lead to the adult and larva wasps rotting once perished. Furthermore, extended moisture within the wall can lead to mold and fungus growth. Removing wasps from your property is not something to be taken lightly. As with other flying insects, wasps are dangerous when provoked. The safest and most practical way to remove them is by simply calling a professional pest control company. Pest management professionals have the expertise and experience needed to accurately assess the situation and take the appropriate steps in permanently removing any wasps found on your property. If you’re having issues with wasps or other pests, contact the pros at Modern Pest Services or call us at 1-888-997-3312.